Al Ewing and Joe Bennett have proved they can do scary Hulk. They can do scary Hulk one-shots. 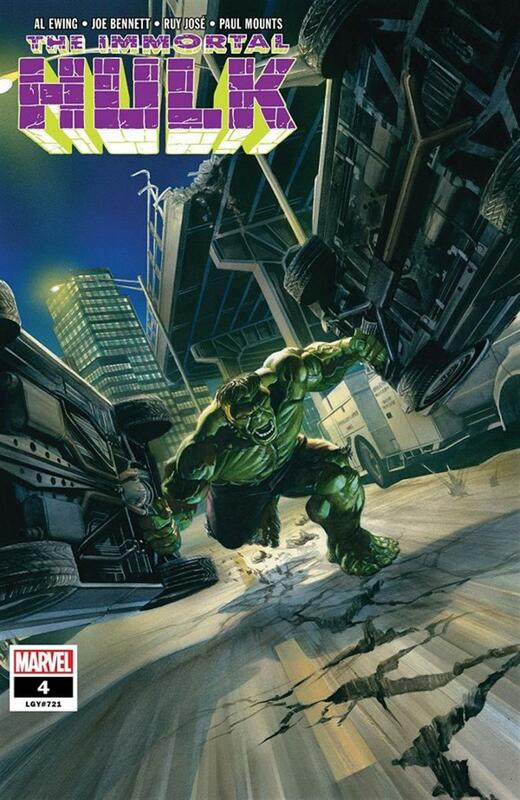 In the last issue, they even did a structurally-ambitious guest-artist Rashomon-style scary Hulk one-shot. Now it's time to start the real story. Immortal Hulk #4 begins heavy on the exposition as driven reporter Jackie McGee pursues the Hulk into Minnesota. She picks up Walter "Sasquatch" Langkowski, and it's thanks to him sharing the Hulk-attuned portions of his life story that the pace struggles a little in the first act. We also get a more intriguing peek into Jackie's past - her relationship with the Hulk did not start with investigating that triple homicide back in #1. Today's Hulk mystery du jour leads from a freeway wreck with a vigilante angle to a dive bar (Trimpe's, to match the Buscema's Diner seen in earlier issues) to a surprise hospital trip to Bruce Banner himself. The first Bruce and Jackie meeting is momentous. It sets the stage for bigger mysteries and a bigger antagonist, and asks big-to-huge questions about the new "nighttime resurrection" aspect of the Hulk. Those questions build big anticipation for #5, as does the prospect of Hulk vs. Sasquatch and this volume's first full-on Smashmonster fight. As noted above, this issue drags a little at the start due to its focus on Walt. I see this as a necessary evil. It's not an argument in favour of Sasquatch as an under-loved protagonist; he is clearly just being slotted into position as a pawn in a bigger game here. I respect the limitations Al Ewing builds into his flashbacks. While we spend a lot of time talking about Sasquatch in this issue, it's still definitely the Hulk's story. It's also still scary as hell, though this chapter goes for subtler psychological horror than the bone-breaking green-gut-splashing gore that the title has previously employed. We are creeping breathlessly back to the Hulk questions that really keep Bruce Banner up at night - why is he trapped in this torment, and who dares stalk the mighty Hulk like a prey animal? Tremendously talented work on expressive faces is the noteworthy strength of Joe Bennett's art here, but the posing of characters and the setting of scenes are certainly not neglected. It's just constantly superb visual storytelling that pulls you smoothly into a spooky, thought-provoking mystery story. Ruy José's precise inking helps sell the intensity, and Paul Mounts's moody colours also make a subtly, constantly beneficial contribution. This is really top-notch art that's all too likely to get overlooked because it succeeds so well at its primary mission: It evokes a believable world around you in every panel. It's so real and so faultless (past the first act and the probably-not-accidental goofiness of Walter Langkowski) that you forget this is a completely fictional environment. Issue #4 of the Immortal Hulk begins setting up the pieces for a bigger story. The slower pace and heavier cargo of exposition might disappoint after the fast, self-contained stories of earlier issues. The enthralling plot and its many tempting questions more than make up for a slow start, and the tale is supported throughout with impeccable art. The first three issues of Immortal Hulk demanded our attention; now that they have it, the creators are dragging us much deeper into the Hulk's scary new world. I love the slow burn pace of the first 3 issues, but it’s time for some Hulk smash action, after all, it’s the Hulk. Love the purple pants origin. Great review.